Jay is a fifth generation Washingtonian and grew up in White Center. After graduating from Ingraham High School, Jay married his high school sweetheart, Trudi. Jay and Trudi then spent 20 years working and raising their three sons in the Yakima Valley. Jay holds a bachelor’s degree in economics from the University of Washington and earned his law degree from Willamette University. Jay first got into public service to fight for a new public high school in Selah in 1985. He then went on to represent the 14th legislative district in the state House of Representatives and in 1992 was elected to Congress from Eastern Washington. Jay later moved back to the Puget Sound area and was elected to Congress in 1998 where he served until 2012. 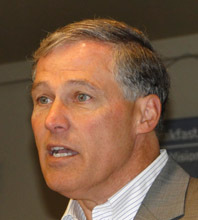 Jay Inslee, who is running for govenor, gave us a peppy introduction to himself and his ideas. Jay is a fifth generation Washingtonian who spent his early married years in the Yakima area and then moved to the west side in 1998 while running for congress. He has served in Congress since. Jay gave us a comprehensive summary of his proposals for managing Washington state. Morris Kremen introduced our Finnish exchange student. Francie Weaver joined the BBRC. Bob Holert introduced our speaker, Jay Inslee, who is running for Governor. Jay mentioned that he grew up in an era of technological revolution in the aviation and software industries and is convinced that the power of innovation is Washington’s secret sauce to creating new jobs. Jay believes that Washington needs to accelerate the commercialization of R&D projects and as Governor he will develop incentives and programs to do it. In addition, he will advocate for an R&D tradeable tax credit. Jay thinks that Washington would greatly benefit by using the lean management system that Genie Industries and Virginia Mason have successfully implemented. President Chris Monger called the meeting to order at 7:30am to the rousing tune of Hit the Road Jack by Ray Charles. Heavenly Father, we come to you today asking for your guidance, wisdom, and support as we begin this meeting. Help us to engage in meaningful discussion; allow us to grow closer as a group and nurture our common mission to promote understanding, goodwill and peace. Fill us with your grace, Lord God, as we share our points of view and help us to be mindful of the Rotary Four Way Test in all that we do. And finally, continue to remind us that all that we do here today, all that we accomplish in life, for the service of our Club and our fellow man, are done to glorify and serve you. We ask these things in your name, Amen. Traci Tenhulzen followed and introduced visiting Rotarians and guests. Chris asked that we bow our heads in a moment of silence for the four diplomats who lost their lives in Libya. Morris Kremen introduced our exchange student from Finland. She is from Nanntali, a small town in Southern Finland with a population of 18,000 and home to the Moonim World Theme Park. Our exchange student has one brother and one sister and her hobbies are cheerleading and snowboarding. She showed us a lot of nature photos of Finland and of favorite Finnish activities, including swamp football and Finns relaxing in a hole in the snow filled with water after taking a sauna. Chris inducted new member Francine Weaver, whose father, Bob McKorkle, is a long-time member of the BBRC. Francine is the owner of Your Equity Services, a residential mortgage lending company. Chris offered Francine the opportunity to choose a BBRC vest or jacket in honor of her induction. Director of Rotary First Harvest. David proudly announced that the BBRC won the Golden Donut Award for the most service hours spent volunteering at Northwest Harvest during the last Rotary year. David invited all members to enjoy a Krispy Kreme donut at the end of the meeting. 1. Jane Kuechle announced that our next meeting on September 21 will be held at The Issaquah Salmon Hatchery. She needs to know ASAP how many will be attending. Jane will be emailing those who plan to attend an invitation to tour the facility after the meeting. 2. Garish Bhatia reminded the Club that we need drivers for the adoption party to be held on Saturday, October 20. 3. Joellen Monson gave us details about the Lake to Lake bike race in September. The proceeds go to fund the youth scholarship that we also support with our 5-10k proceeds. The race occurs on September 22nd and contributions are $15 for adults, $10 for 17 and under, and $30 for families. For more information call 425-452-6885 or email bikeride@bellevuewa.gov. To register log on to myParksandRecreation.com.